You may never buy a store made Rotisserie Chicken again. Control your ingredients...and an hour later you'll have a PERFECTLY cooked bird you'll be proud to serve your family or guests! 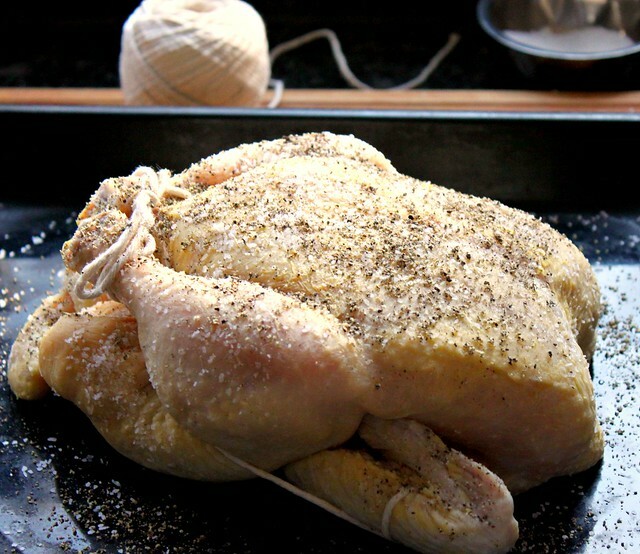 Next, take 1.5 teaspoons kosher salt, about 1 teaspoon fresh cracked black pepper and sprinkle all over the DRY bird. Place your bird into your preheated oven and roast for 45-50 minutes - do not open the oven or baste the chicken while cooking - hands off! 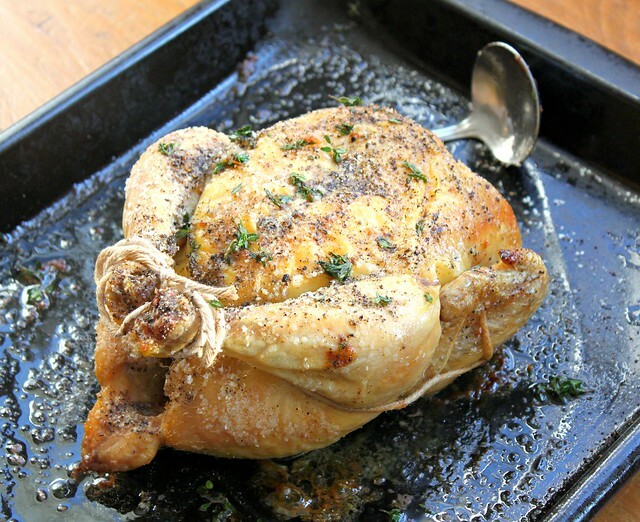 After time is up, remove your chicken from the oven, take a handful of fresh thyme and place it into the pan with the drippings from the chicken...whisk around and spoon on top of the bird. 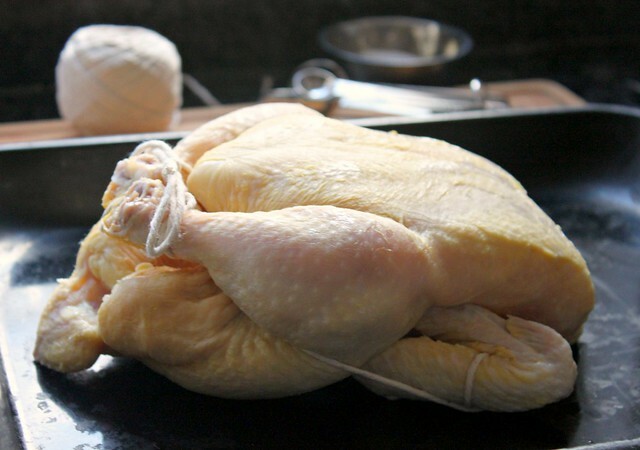 Let that chicken rest for 15 minutes to retain its juices! 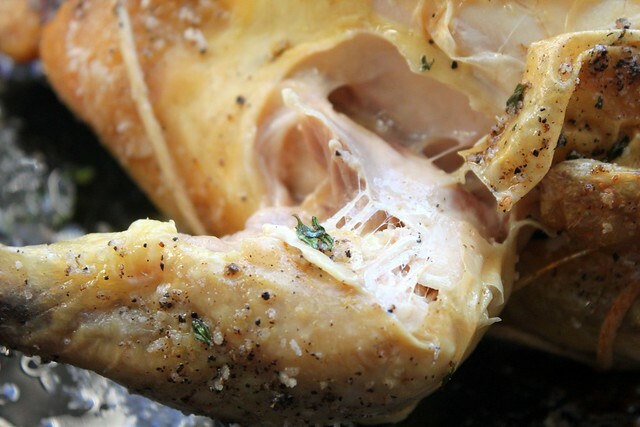 Super moist and delicious inside...super crispy and flavorful skin! Simple, delicious, and the stuff great meals are made of. Your photos are amazing! A simple (well, not really) but perfectly executed roast chicken remains one of the best meals ever. Yours looks sublime. Ok, that bird looks incredible! 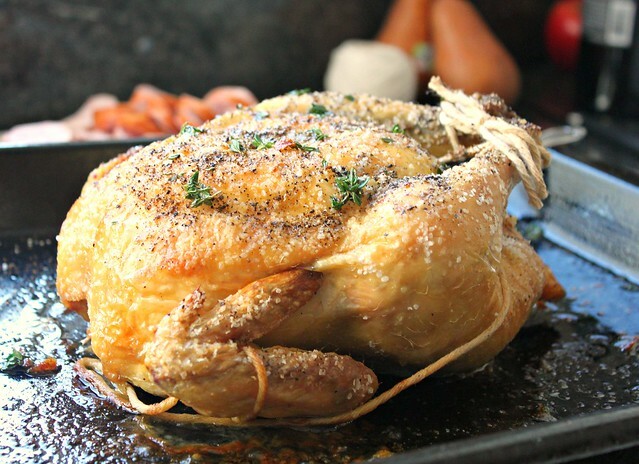 And you are so right - roast chicken is very easy and oh, so yummy!! Besides a hamburger off the grill Roasted Chicken is just the best! I'm liking this methos of sprinkling the thyme on after. And great photos. Woah...that looks perfect! I have to admit that I usually cheat and buy the rotisserie chickens, but not having to do a thing to this once it's in the oven doesn't sound so bad! Keller's recipe is what I use and have never been disappointed!! I see you've trussed the bird here, my preferred method too :) Gorgeous photos as always! We are making this tonight! My son has a dairy allergy and a lot of recipes have an ingredient that he cannot have - this one fits the bill and we can't wait to eat it - it looks awesome!! Girl your pictures are getting all pro and stuff. I hate you. Anyway - I love this chicken. 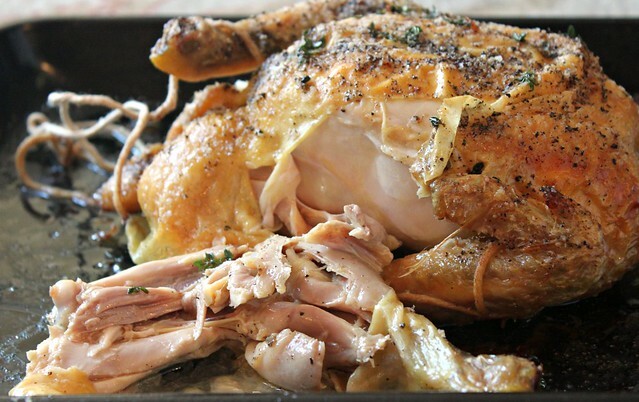 A good roast chicken is probably one of our favorite dinners - I will have to try Mr. Keller's. Thanks for sharing! It looks absolutely delicious. 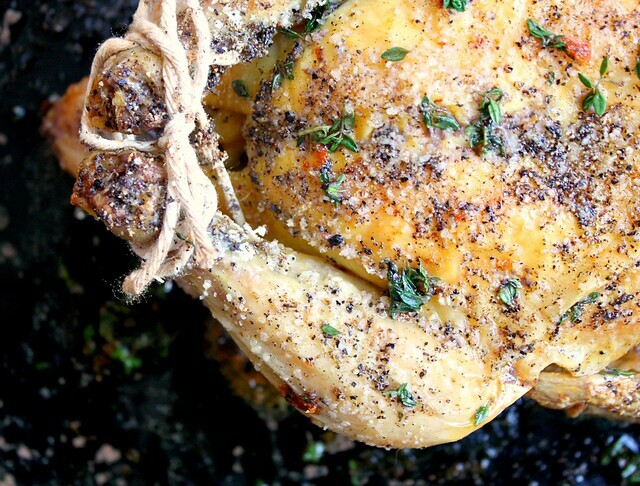 I am going to try this for sure, I love chicken and this one looks like something I would be happy to devour! @CC - that's what I thought when I was making the chicken - how great that there is NO BUTTER or OIL!?!? This way of cooking the bird clearly shows you DO NOT need it!!!! I hope you loved it! Thanks to Thomas Keller for this wonderful recipe!